(Probably) John Critchley Martin, Narborough Hall, Norfolk; sale, 15-16 September 1926, lot 269 (acquired by the great-uncle of the present owner). 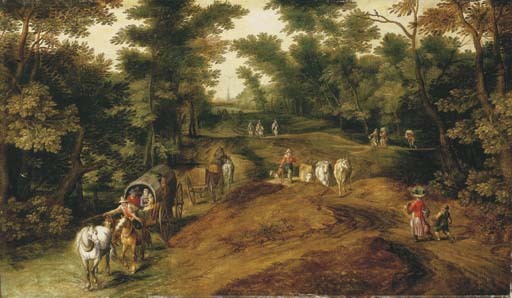 The composition would appear to derive from that of the eponymous work by Jan Breughel I formerly in the Perman collection, Stockholm (see K. Ertz, Jan Breughel der Ältere, Cologne, 1979, pp. 151 and 587, no. 176, fig. 163), for which there is a preparatory drawing in the Nationalmuseum, Stockholm. The main difference in composition is the absence in the present work of three cows in the centre foreground and the inclusion of the two figures in the right foreground. Ertz, loc. cit., notes that the attribution for that painting can only be provisional, it being known solely through old photographs. However that the present work derives either from it or from a shared precursor, rather than from the drawing can be inferred from the closely similar arrangement of the trees, absent from the drawing.